I’m afraid that after three days of an Olympia exhibition – even one as good as the Allergy Show – you are slightly losing contact with reality, as you can see! 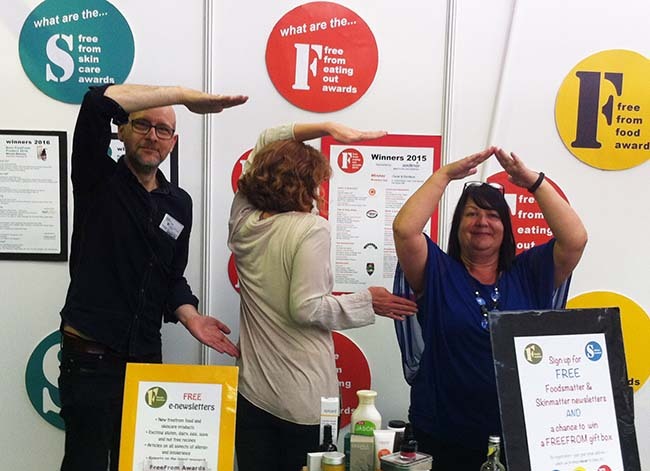 This is Alex, Cressida and Kathy (of the FreeFrom Eating Out Awards – our newest recruit) ‘being’ FFA – FreeFrom Awards. Not sure that we are employing Alex as an ‘F’ again!!! But a very lovely show it was – enhanced this year by Doves Farm’s splendid centre ‘space’ – rather like an open barn in the middle of the show. It included two demonstration kitchens, a meeting area round nice wooden table where Claire and Michael Marriage held mini seminars and discussion sessions, a shop tucked round the back and a lovely stage in the corner where they ran yoga sessions in the mornings (packed out) and a band played in the afternoon! 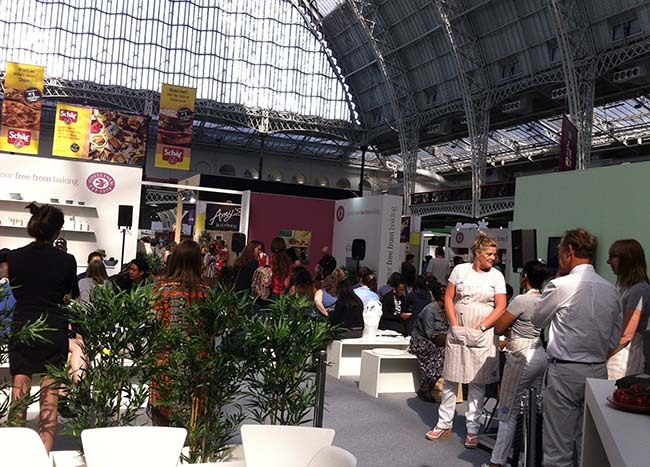 Rumour has it that this was so successful that it might become a regular feature at all Allergy Shows…. The show does usually collide with Wimbledon final weekend – and with Grand Prix at Silverstone – but this year it also had to contend with Olympia Overground station being, effectively, closed and ‘works’ on the relevant underground lines! But, nothing phased, allergy sufferers and freefrom enthusiasts flocked along in ever greater numbers – although several people noted that this year there seemed to be a lot of visitors who had no specific interest in allergy and just seemed to have come for the show. Just shows you how far freefrom has moved into that ‘mainstream’ we are always going on about. We were more than usually busy both on the stand and off. 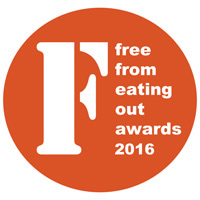 On stand Kathy was extracting the names of their favourite freefrom eateries from everyone who passed in her quest to ensure that EVERY cafe, restaurant, B&B, fish and chip and pub that serves freefrom food enters this year’s FreeFrom Eating Out Awards! Meanwhile, Cressida was combing the floor for new and exciting freefrom products – of which there were an AMAZING number. You can see her extremely comprehensive run down of what she found on the FoodsMatter site here. 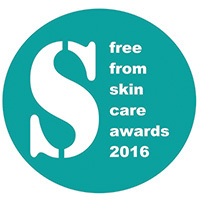 On Friday afternoon, Alex, Nicola and I were were more than fully occupied in the Pillar Hall with the FreeFrom Skincare Awards presentation. We had a record turn out – both in terms of entries (270 odd) and attendees at the presentation – the Pillar Hall was full! And, as always, there were lots of very very excited and happy winners. 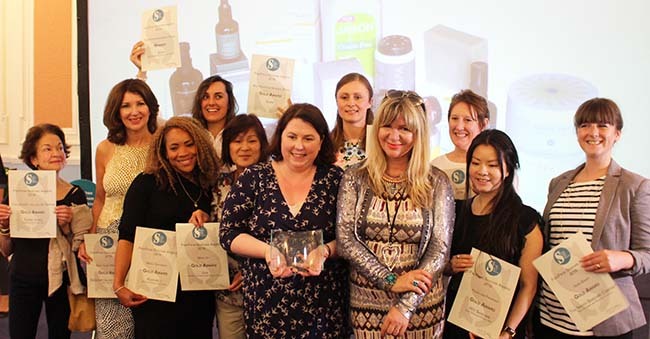 Here they all are with Janey Lee Grace who was doing the honours – on Janey’s right is Fiona Treacy of Kinvara Skincare in Ireland who scooped the Best Skincare Products 2016 trophy for their Absolute Cleansing Oil. If you would like to know more about the winning products, check in to the awards site here where they are all featured, with the the judges’ comments and details of where you can buy them. There will also be a video with interviews with Fiona, Janey and others very soon. 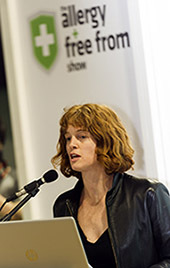 Meanwhile, on Friday morning I had been chairing and speaking at the Allergy Show’s trade conference, FreeFrom Today, FreeFrom Tomorrow which had covered some interesting ground – including the hoary question of whether there is any such thing as bad publicity, especially with reference freefrom. This was my patch and I’ll blog more on it as soon as we have the Skincare awards videos and edited and up on the site! But we also covered whether the freefrom industry had got to the point where it needed its trade association to speak for it, where freefrom innovation can go next and the whole issue of how clean and healthy freefrom foods really are. Elsewhere around the show there was a plethora of other interesting talks, presentations, discussions and interactive events. 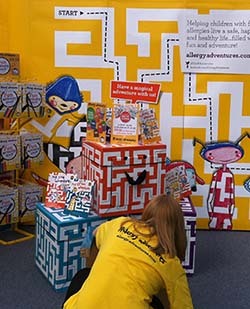 Allergy Adventures was there as always – here is Hailey getting ready before the onslaught of children needing to be entertained! Across in the Learning Centre and then at Speakers’ Corner you could find Dr Polly James, the wonderful child psychologist who is running the new psychology service for allergic children and their parents at St Thomas’ Hospital. She explained exactly what her role involved and how she was helping allergic families cope with the anxieties and difficulties of living with life threatening allergies. The service is being funded by Action Against Allergy and there will be an article in AAA’s next newsletter about what she is doing. That was on Saturday but on Sunday it was Cressida’s turn to take over at the Learning Centre. She was talking about dairy sensitivity and giving a fab run down on the impressive number of products now on offer for those on milk or lactose free diets. 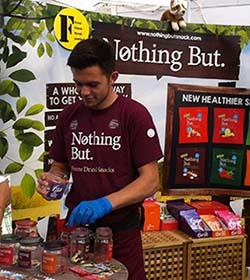 (You can, of course, check up on all of those products in our food directories, on Cressida’s rolling news pages and, I am sure in her mammoth round up of the products that she found at the show.) Other interesting presentations covered Sugar and artificial sweeteners, Dr Adam Fox from St Thomas’ looking at current thinking in the treatment of food allergy, a number of coeliac presentations and Dr Nick Read on managing IBS. But while all these heavy matters were being debated, out there on the floor it was all go – with a very satisfying number of those little yellow Food Awards roundels dotted around the stands too! There were some really interesting products – including snacks of every shape, size and description. Several freeze or air dried snacks such Nothing But, flavoured chick peas, nachos made from anything you can think of, and, and, and…. I had three favourites. 1. Fermented coconut with sauerkraut from Rhythm which does sound fairly unappealing (well, if you are not particularly into fermentation anyhow) but actually turned out to be delicious. A fresh, tasty, crunchy little salad in handbag size pack – perfect for lunch. 2. Flavour Fusion from Good Carma, a new start up in Wales. This was being offered as a Parmesan alternative – and I have certainly not had good experiences with Parmesan alternatives in the past….. But this one, made from ground almonds, yeast, Himalayan pink salt and basil, was actually really tasty. It genuinely would work on top of pasta. 3. 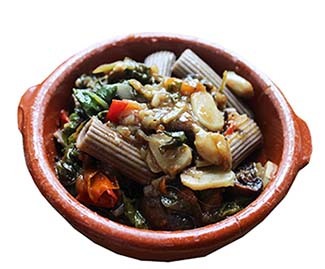 And finally some superseed pastas from the Supergrain Pasta Company who hail from Hungary. They are so much of a start up that they had literally only got their home-built website up and running on the night before the show opened – and by the time I saw them on Sunday it had already crashed because so many people had tried to access it!!! I hope we will carry an article about them soon but they are a gardening husband and wife, she gluten free, he diabetic and gluten free; she Hungarian, he English. Anyhow, I do not suggest that you try to buy anything from them for a week or two until they have got themselves a bit more organised but after that, go for it! I am sure that Cressida will cover them again anyhow. And finally, to give you a 6 second laugh before you go…. Having done the rather unconvincing ‘FFA’, Cressida then filmed Kathy and I elaborating on the ‘A’…..
Oh, I am SO sorry, Alex – how unappreciative…. You remain on the FFA team then…. Well done Michelle. A Great show! Thank you, David – although the credit goes to the organisers, not to us!! I didn’t see you there – hope you are well! Perfect Italic Alex.. Good to see you and the show again. Certainly some fantastic new products to try..